Hello to all of you lovely readers of Pastels and Macarons! I’m Jelica from the home décor and craft blog A Pretty Fix and I am so excited to be contributing a guest post here for the first time. Today I have a really cute DIY Minimalist Felt Boxwood Wreath tutorial to show you! I don’t know about you, but I’ve always adored boxwood plants! There is something so delicate, yet strong and beautiful, about them. And at this time of year, they are the perfect plant to incorporate into any aspect of holiday décor, from little clippings used to adorn gifts or place cards to long garlands and, of course, wreaths both slender and robust. 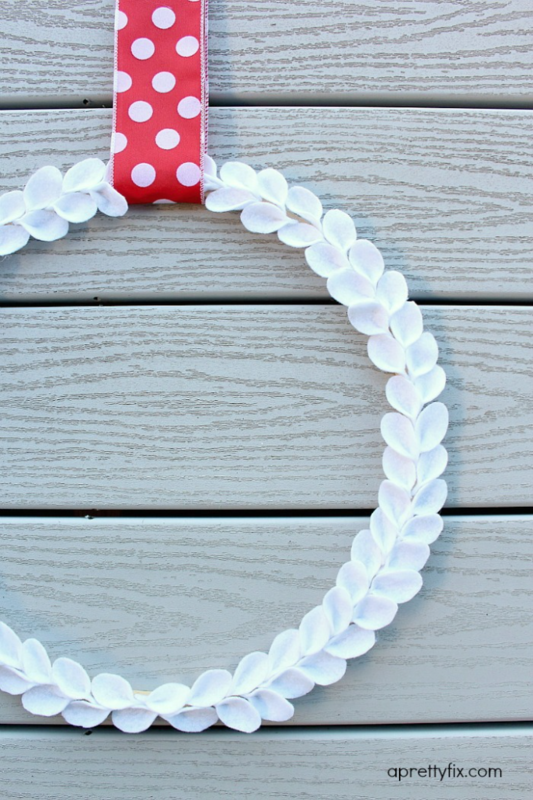 For this project, I wanted to create a chic and modern wreath, but one that could last. Turning to felt – one of the most versatile and easy-to-find craft materials out there – I decided to interpret the delicate green leaves into soft white ones that wouldn’t die out! I knew it would be the perfect complement to my Christmas décor which, for the past couple of years, has been a mixture of whites and creams and mixed metals of gold and silver. I love how these soft colours contrast so well with the deep green of our Christmas tree as well as all the lovely greenery normally sprinkled throughout the home. First, using the small spoon begin tracing your leaves on your felt. For a 12 inch by 14 inch square of felt, you should be able to fit 46 tracings. Next, begin cutting out the leaves, taking care to cut just inside the tracings. For this project, you will need approximately 90 leaves (using 2 sheets of basic felt). Once the leaves are cut, it’s time to start giving shape to them! This part is a lot of fun, but takes a bit of time. Taking your glue gun, place a dot of glue on one end of a cut leaf, as pictured below. Pinch the base together, waiting a few seconds to allow the glue to dry. Repeat for each of the remaining leaves. Once you’ve created your leaves, you are ready to make your wreath. This wreath is made up of two rows of leaves, corresponding with the two rings of the embroidery hoop. First, mark the mid-point at the bottom of the hoop. For this wreath, the leaves will radiate outwards from the mid-point. Taking the first couple of leaves, add a dot of glue to the base of the backside of each leaf and glue directly onto the outer ring of the mid-point of the hoop. Begin adding your leaves, alternating between the outer and inner ring. Each leaf is placed slightly in front of the previous one in a staggered formation. This creates a more natural and realistic look. …making your way up both the left and right sides, until you reach the top, mid-point of the hoop. Before hanging your wreath, take a closer look to make sure you are happy with your creation. If you need to pull off a leaf or two to replace them, go ahead and do it – they can be replaced in a snap. Once you are satisfied, add a festive ribbon and hang your wreath! This wreath is gorgeous! I love the simplicity of it. Thanks Kati. Jelica did a fabulous job. Oh man, this is so gorgeous! I want to make it now! I never would have guessed it was made of felt!! It would be a perfect wreath for winter once I take my Christmas wreath down! It’s so lovely isn’t it. The possibilities are endless. You could make one that’s thicker also or a different colour! Jelica did a fab job!